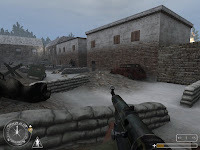 This map was the second realisation after the great escape,to be release for CODUO and for a 3 week building time (like the author explain in the readme) it's a really well put together map. Design is average in a not too linear way, creating a well crafted snowy village that has been extremely damage by heavy fights. The terrain isn't flat and buildings are well put together but perhaps look sometimes too repetitive and also their general inside layout looks way too empty. 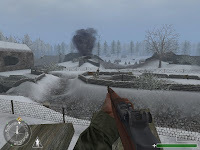 Gameplay is balance through diverse objectives quite well handled (from sniping to resisting counter attacks passing by an intense street war). Progression is mostly squad based (perhaps a little to oriented) and fearly enjoyable but can be sometimes frustrating through some challenging spot. It could Have certainly add some tank battle or destoying objective but the scripting is ceraintly the biggest part to learn from Call Of Duty and regarding the short time used to create this map I doubt it would have been handle like the author would like. The ending may look perhaps a little bit disapointing through the fact you join you squad at the place the battle started. In conclusion: for a 3 weeks work and even if it's perhaps a little to standard, it's a fearly enjoyable experience that add everyting to make a quite enjoyable experience.